Artist Cassandra Graus, otherwise known as Kitty Cassandra, is a self-proclaimed cat painter, inspired by her flat-faced exotic felines. 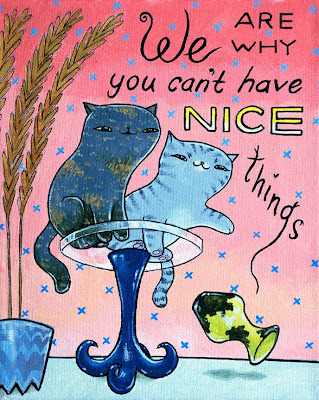 Graus creates her art on commission, but also has an online print store filled with cute and quirky creations of her signature rounded cats. 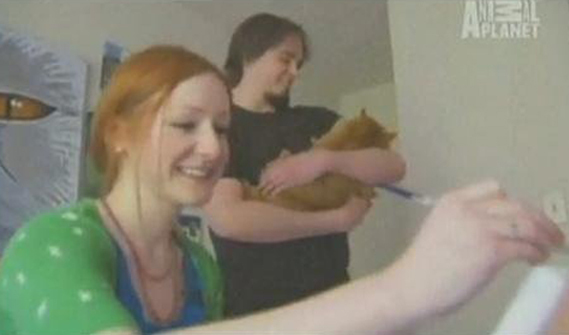 She lives in Virginia with her husband Joe ("the father of her cat-babies"), and their four kitties, Walnut, Caruthers, Fergie, and Templeton. 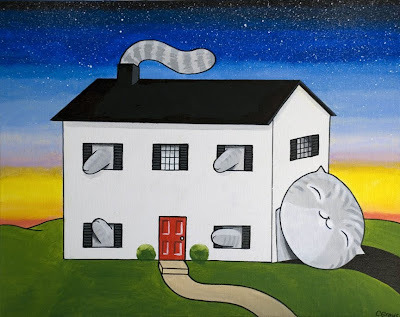 While currently working a regular day job, Cassie hopes to one day devote all of her time to cat painting, "and making the world more absurd and ridiculous -- absurcuous -- one custom painting at a time." With nearly a year long waiting list for her commissioned work, an appearance on Animal Planet's Cats 101, and a published children's book under her belt, I'd say this emerging talent is well on her way! 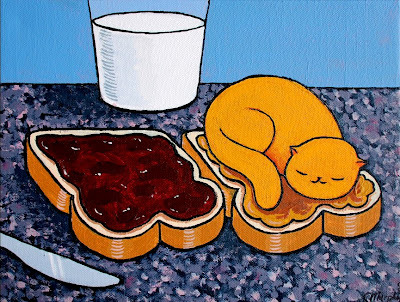 Cassie recently agreed to sit down and answer some of my questions, and we talked about everything from how she became a cat artist, to why food figures so prominently into her work! Hey Cassie! Please tell us a little bit about how you got started painting. I had always painted as a kid, what with my father being a painter and artist, I suppose it's in my blood. 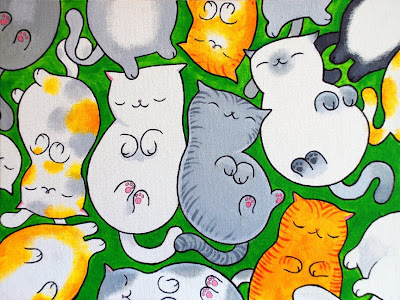 I had even drawn cats as a kid, but I really got into painting cats my last semester of college, when my coursework was winding down and I could finally take up a hobby! So I had my husband (fiancee at the time) drive me to Michael's (I didn't have a car) to buy brushes and two canvases, and I sold those first two paintings a week later for $100 to a nice lady on a Persian cats forum, and I just kept practicing and painting from there! With a million zillion infinite possibilities in terms of painting subjects, what made you decide to become a cat artist? 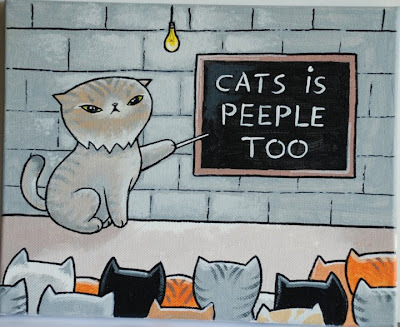 If nothing else, the internet has shown me that I am not alone in finding anthropomorphized cats to be hilarious, so I knew there would be an audience. Cats are so human-like, even the worst parts of humanity, from killing things for sport all the way down to general, everyday mischief-making. But on the other hand they're pretty harmless and lack the mental and physical faculties to purposefully ruin anything too important, so the contrast between inner evil and the inability to do any real harm is funny to me. And I've always wanted to make people laugh, so I thought that painting would be a good way to channel that! The feeling I get from people pointing and giggling at something I've created is the best ever. I have four cats, Walnut, Caruthers, and Fergie (all girl exotic shorthairs) and Templeton (a himalayan male). Walnut is extremely lazy and sleeps in Joe's spot on the bed (with her head on his pillow) while he's away all day like she's holding vigil; Caruthers is just dismayed at most things and looks disapproving all the time (but the only time she ever meows is when we clip her nails, because it's the worst thing she will ever experience); Fergie is shy and reserved and would rather watch you from a dark, hidden place; and Templeton is a holy terror -- a very vocal, hyperactive little boy who antagonizes his poor sisters and loves every minute of it. How are the cats involved in your creative process? Are they allowed in the room where you paint? It's funny you mention that, because I always have to lock them up in the bedroom while I'm painting, I call it "losing their privileges." 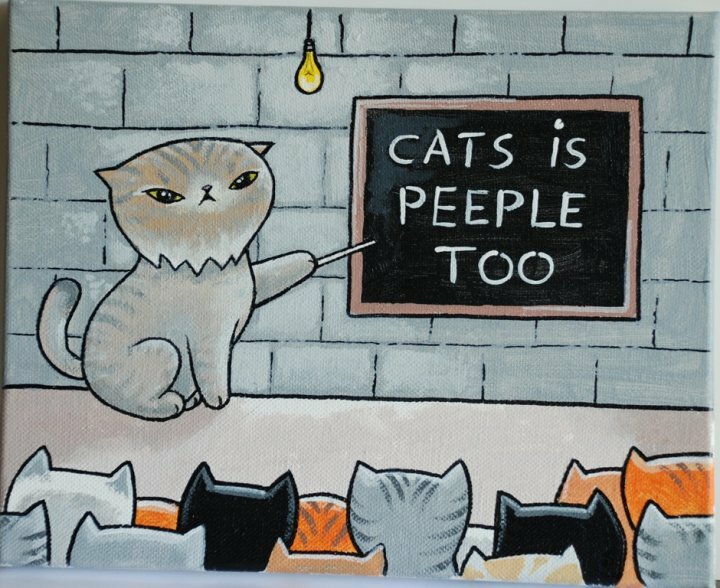 If I don't, they will stomp in a puddle of paint, step on my canvas if it's laying flat, storm onto the table I'm painting on, wisp their tail across a wet canvas and leave a couple hairs behind -- it's a disaster. I have more than once had to wash paint off of cats' paws so they won't lick it off and poison themselves. Chances are there are several cat hairs in every painting I've done. I'm in love with all of your work, but some of my favorite paintings are your food related pieces like Peanut Butter & Jelly Kitty, Kitty Sundae, Meatball & Kitty Sub Sandwich, etc. What inspired these kitty culinary creations? I am a foodie at heart and take great joy in eating, maybe more than most people, so food is often top-of-mind for me, so I guess that manifests itself when I'm sketching random things to paint. 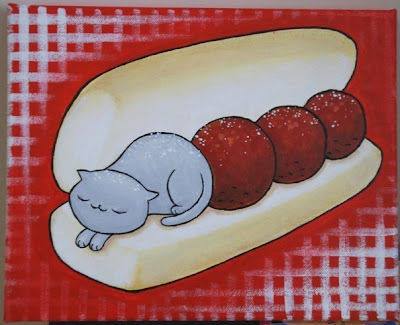 I think putting cats on/in food is also an ode to surrealism (which I've always loved, especially Magritte and Botero) combined with that evil element: if a cat could comfortably curl up in a cat-sized, warm meatball sub, it totally would, and ruining your meal would just be an added bonus in their mind. It was really neat -- I've always been into show business and fascinated by TV/film behind-the-scenes stuff, so to have a camera guy, sound guy, producer, and production assistant come into my home and put a mic on me and just tape for like 5 hours was like a dream come true. When CATS 101 first messaged me through my Etsy page telling me about how they're looking for an "off-beat" story about someone who works with exotic shorthairs, I -- and especially my husband -- thought it might be a scam, but I gave them a call and my naïveté finally paid off. What's up next for Kitty Cassandra? I would really like to work with a big publisher on a funny storybook, either for kids or adults, or work for a greeting card company, and just keep doing custom work of people's pets! they go about doing so? Thanks so much to Cassie for taking the time to answer my questions! If you'd like to learn more about her, commission a painting, or order a print, visit her website for more information! She also has a Facebook fan page where you can follow her latest updates, and a brand spankin' new blog, too! Lovely! You remind me a little of Luis Wain -- I have a print of his I picked up in a shop in Windsor. Congratulations on your success! Her style is really enjoyable! If she wants to join a greeting card site, she should try Greeting Card Universe. It's been working well for me so far! Own! I´m IN LOVE about this paints! Congrat to the wonderful artist! OMG THANK YOU for introducing us to Kitty Cassandra, I am completely in love with her art work and look how beautiful she is as well. I am in love with her artistic style, her work is endearing! !